The Catholic Center at Boston University has been blessed for the past two years with the presence of a young man named Bobby. He graduated two years ago from BU and has volunteered full time at the Catholic Center since then. Bobby will get his own post here some day. I mention him today because he is the creator of the attached meme. I knew I made it big when I had my very own meme. (I don't think my eyes look that crazy in real life). 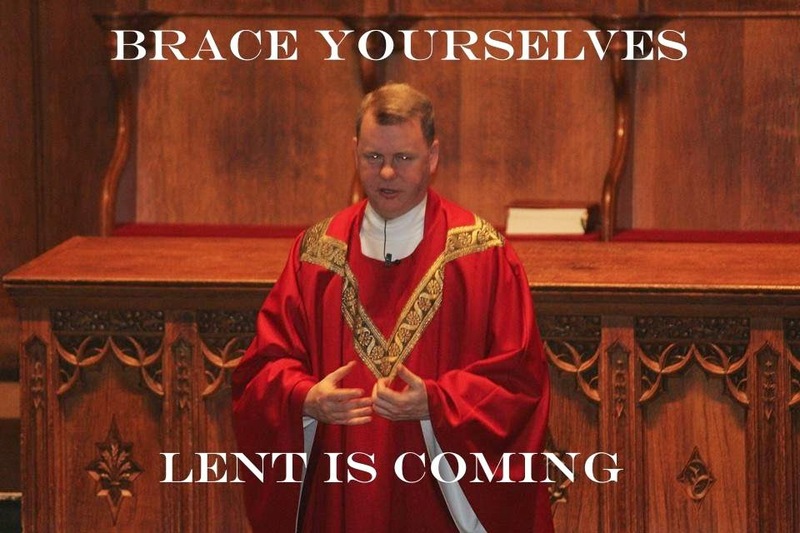 The fact is, every year, probably a couple of months before Lent begins, I start saying, "Lent is coming." Why do I say it? I say it because I need to hear it and to be prepared for it. I say it because Lent is a BIG opportunity. Here's the deal: for mature Christians, Lent needs a little bit of reflection, consideration, and preparation. You don't want to be 55 years old and on the day before Lent begins be saying, "Well, I guess I could give up jelly beans." Or, we don't want to be saying on Ash Wednesday, "Yeah, I've got to think of something to do for Lent." Because if that happens, the next thing you know, Lent is half over and you're saying, "Well, I guess I blew it. I will just do something next year." Or, you don't want to go gangbusters a week before Lent saying, "I'm going to pray for three hours a day, eat once a week, and donate half of my earnings to the poor." Then, by the Thursday after Ash Wednesday you're like, "Yeah, I'm not really going to do all of that. So, I guess I'll do nothing." Lent is coming. February 18th is Ash Wednesday this year. What are you prepared to do? I think it has to be serious, but not unrealistic. By serious, I mean let's not wimp out. Lent is a time of fasting and abstinence. Sometimes I hear it said, "Well, I think that this year I'm going to add something rather than give something up." Now, don't take this the wrong way, but come on! How about add something AND give something up. Add fifteen minutes of prayer each day AND give up coffee or booze or bread or meat or something that is a little bit challenging. Add spending time with people who are lonely or isolated AND give up one meal a day. Yes, we can also give up gossip, impurity, envy, anger etc. But, actual fasting from physical food or pleasures makes us spiritually better fit to give up those other vices. I don't think there is any way around the fact that we need to be serious. But, we don't have to be unrealistic. Do something that is challenging, but not bound to failure. Many of us have, at one time or another, entered Lent with too grandiose a plan. Let's not set ourselves up for failure. Something that inconveniences us, hurts a little, but that will make us joyful in the effort. Something that is possible. Everyone is different. Every year is different. I offer here just a few examples of things that we could do during Lent. Certainly, it is not an exhaustive list. Just some things to get us started. Giving up reading my blog---OF COURSE NOT. Like I said, everyone is different. But, we all need to grow in the spiritual life. And, for two thousand years, the Church has been saying that three key ways to grow in the spiritual life are Prayer, Fasting, and Almsgiving. Since the Church has been saying that for two thousand years, it's unlikely that she will suddenly say, "Hmmm.....nah . . . that fasting, prayer, and almsgiving stuff isn't so important." For me, one thing that I've discovered to be very helpful to my life is to live my Lenten disciplines along with others. That doesn't mean that we are all doing the same thing, but it does mean that we encourage one another during Lent. Living Lent together is a beautiful and powerful experience. We pray for one another and we learn from one another. This experience of living Lent with others really helps me. This isn't a way of boasting to one another about our sacrifices. It is a way of helping one another to remain steadfast. In fact, the whole Lenten liturgies presume that we are all living Lent together. I'm very grateful for the people who help me to live Lent well. Another thing that I've learned during Lent is that I might fail. It's not an all or nothing proposition. If you give something up and fail or if you add something and don't do it one day, start again tomorrow. Don't just completely cave in! Something that I learned about myself one Lent is that I was too attached to my particular disciplines. I liked being able to say to myself, "I gave up "whatever" for all of Lent." So, some years, I decide, "I'm giving up (alcohol, coffee, lunch . . . whatever) unless I'm with someone and they offer it to me." In this way, I pretty much give that thing up for all of Lent, but I can't claim that I gave it up completely because there were one or two occasions when I had it. It's hard to explain, but for me, it is a pride thing. By having the cup of coffee on those one or two occasions or by missing my Holy Hour in order to meet with somebody, I deprive myself of the "pride" of claiming total success at the end of Lent. Everyone is different. And, of course, Lent isn't simply a self-improvement program. Lent is about Jesus. Lent is about drawing closer to Him. Through our praying, fasting, and works of charity, we are drawing closer to Christ. We are better able to hear his voice, to recognize his presence, to hope in his promises, to love with his love. If all we do for Lent is give up something or even develop some particular virtue, we are missing what is most important. Lent is about Jesus. We want to be more on fire in our love for Christ at the end of Lent! Serious, but realistic. We want to live Lent as though eternal life is important to us. And, we want to live Lent recognizing that we grow a little at a time. Don't let Ash Wednesday arrive and find you unprepared. Lent is coming. It's the little stuff. That's what moves me about being a priest. It's usually not the stuff that would make for an interesting vocations' commercial. Sure, like every priest, I've had those moments when I've found myself in the midst of a "big" story. I've had those moments when I've anointed someone at an accident scene moments before they've died. But, it's really the little stuff that moves me. Now, I know that the things I'm about to mention actually aren't "little." No more, for instance, than the little moments that fill up the life of a father or mother. While they might be proud of their children when they graduate from college, probably what they most love about being a parent are not those "big moments," but the memory of a little child crawling into bed in the morning and talking about life, or sledding after a winter storm. For me, priesthood is in these moments. The every day moments. "Father, do you have time for a confession?" Do you know how great it is to hear a young person ask that question? Now, I know that confession isn't a "little thing," but it is something I am asked routinely. Getting a call or a text from somebody who really isn't living their Catholic Faith any longer. Sometimes, as a priest, you find yourself the last thread of attachment for someone. They have drifted away from everything Catholic, except for you. While it breaks my heart to see someone no longer practice the Faith, it is a beautiful privilege to be an instrument of attachment. Usually, these conversations are not about religion or Faith. Sometimes, the hard work of being "an instrument of attachment" pays off and the person comes back to the Faith. When a young person shares that he is thinking about a vocation to the priesthood. Total privilege. Meeting with couples preparing for marriage, having dinner with families, and watching people raising their families. Sitting in adoration today with about twenty young people. Praying for them and for their intentions. Witnessing up close how God works in the lives of people. Watching a community of Catholics love one another. Getting a humorous text from one of the kids. Discussing theology and spiritual matters with someone. Watching seminarians grow in their vocation. Seeing how God is using good priests whom I encounter to do great work. Being told by someone that they pray for me. Preaching the Gospel every day. Not an exhaustive list. These are just things that pop to mind today; the routine things that make up my day. They are the things that move me and make me grateful. They are where most of my priestly life is lived. 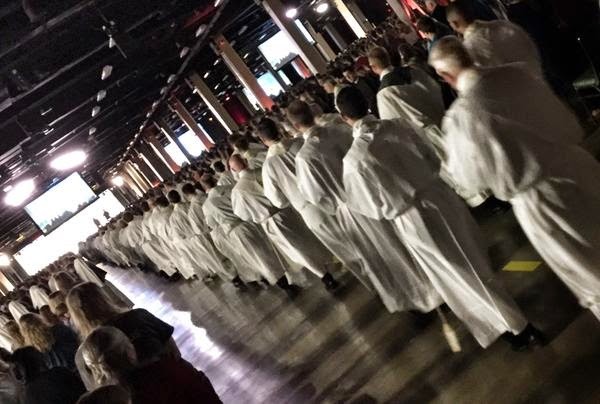 It's in these small moments--lived mostly unseen or unnoticed--that the vast majority of priestly life is lived. It's in many of these "little things" that a priest encounters others and enters into a profoundly close relationship. We are privileged to draw near to another human being and to be trusted by them. God uses our humanity as an instrument of encounter. And in the process, he builds up the priest as well. Sometimes, it is easy to get caught up in the "big things." Social media keeps us informed of every Catholic controversy everywhere. It can dominate the Catholic social media. Or, we can become too attentive to the "big things" of Church politics. But, the little things are where it is really at. This is where the Church lives. Today, twenty college students and I had Mass together and then a Holy Hour. It's a little thing. Kind of like a seed that is planted in good soil. It grows thirty, sixty, and a hundredfold. Someone once told me that his pastor would always say to the parishioners, "Look, this is not my parish. It's your parish. I'm leaving here in a few years." That was his way of trying to get people to take responsibility. I understand that he was simply trying to motivate people, but his experience and mine are completely different. For me, priesthood has to be lived from the inside of an experience. The priest is not the one responsible for "creating" an experience or an encounter. For me, when I'm passionate about something it is because it is mine, something that I'm living, something that moves me. Evangelization is a response to an experience that I am presently living, something that is happening to me. It is not something that I create. Earlier this week, I was just totally dragging. After a few days, I went to the doctor and came home with a case of pneumonia, but I'm feeling much better now that the antibiotics are doing their thing. During the week, however, I was remembering that when I was a pastor, a few sneezes would result in a long procession of wonderful women from the parish arriving in my kitchen with containers of homemade soup. Doubtful of my cooking abilities, they often attached very detailed instructions that contained everything except a diagram of how to find the stove. "Father Barnes, if you put this in the microwave, be sure to take the aluminum foil off first. You CANNOT put aluminum foil in the microwave." Each of those containers of soup was an expression of an affection, a bond, a relationship, an event that I was living from the inside. It deepened in me my affection for those people--not just those individuals, but the whole community. When you are working with college students, there is no soup line! (I'm actually grateful for that. Pop Tart Soup just doesn't sound all that appetizing to me). This week reminded me again, however, that I live the encounter with Christ from the inside. There were all of these small moments of charity on the part of others in our Catholic Center community (and in the rectory where I live) when I encountered the love of God. They were little things; like when I came home from work one day this week and bumped into the pastor of the rectory where I live. The day before, he told me that I should not go to work and should rest. But, I didn't listen. When I bumped into him on the stairs, I felt like I was in high school and got caught sneaking in during the middle of the night. The next day, I stayed in bed. I'm grateful for that kind of fraternal charity. People at the Catholic Center going out of their way to give me a ride to the doctor's. Charity. Staff members picking up my slack. Charity. Priest friends and lay friends who just checked in. Charity. All small things, but it is these small things that build an attachment. Without affection, without charity, without friendship, parishes, communities, and presybyterates lack humanity. People (like me) are looking for something that will answer the great desires of the human heart. When we see and encounter the true humanity that is offered through the life of the friendship of the Church, this draws us in and attaches us. It is particularly edifying to encounter this type of love among young people. 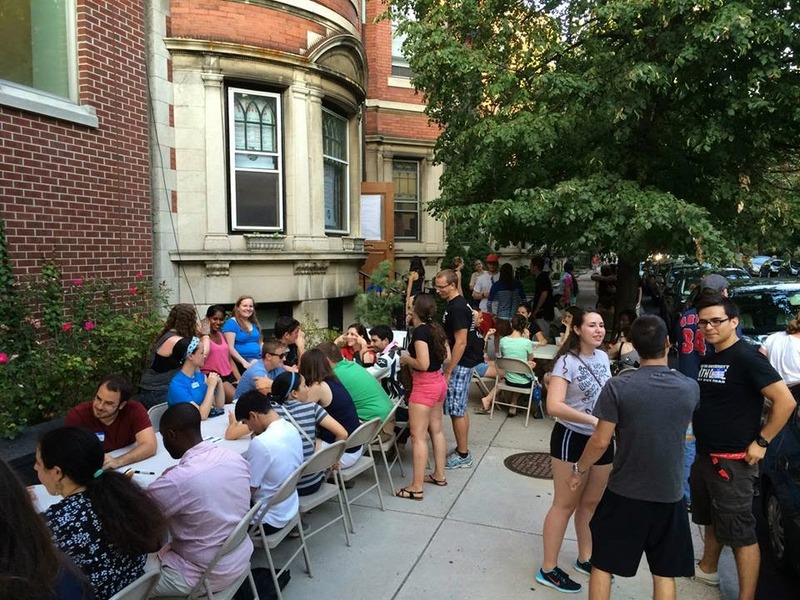 Recently, one of the college students said to me, "You know what I really like that we do at the Catholic Center? I like how a big group goes out for lunch after Sunday Mass together. I like it because it is not an 'official' event or something that we plan. It just happens." Music to my ears. This is not something manufactured or obligatory. It is an attachment. It is the result of an affection that these students have for one another. That weekly lunch that "just happens" is for me a sign of true life. It is something that arose organically among the students. It often consists of many of the same students and staff, but it is always open to others. It is attractive because one sees that a friendship exists at that table in the dining hall. After a week of being sick, I'm convinced all over again that one--often overlooked--key to evangelization is friendship. The human heart desires to be loved and to love. In the friendship of the Church, one encounters a love--an affection--that awakens a new humanity within the person. When we are faithful to this friendship, we are re-evangelizing one another. We are sharing with one another all over again the good news of God's love. I need this re-evangelization daily. I need to encounter the good news of God's love daily. When I am evangelized by the love of those with whom Christ has placed me, it draws me closer to them. This friendship becomes attractive to others because it corresponds to what every heart desires. Throughout the Church we are telling people that they have to get out there and evangelize. At the same time, we have to make certain that those people are living the Christian Event from the inside. If they aren't living the friendship of the Church themselves--if they are not living a friendship that awakens their heart and deepens their own humanity--then there's no way they can go and evangelize anybody. In order to move others, we ourselves have to be moved. We need to continually awaken within one another the realization that we have been chosen and are living something that is truly great. The way to do this? Live our friendship together in charity. It was about four o'clock in the afternoon. John the Baptist had pointed to Jesus and said, "Behold the Lamb of God." Decades later, John the Evangelist remembers the encounter with precise detail. He remembers that he was with Andrew. 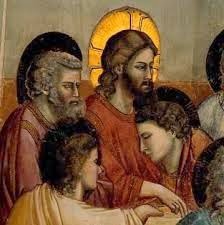 He remembers that it was John the Baptist who pointed him out. He remembers Andrew going and getting Peter. He remembers that it was around four o'clock in the afternoon. In the first reading we heard today at Mass, something very specific happens. Three times during the night, Samuel thinks that Eli is calling him. Finally, Eli advises Samuel that if it should happen again, Samuel should say, "Speak, Lord, your servant is listening." Eli helped Samuel to hear and respond to God's word. John the Baptist helped Andrew and John. Andrew went and got Peter. God uses us to reach others. This is evangelization. This morning, about thirty-five students who have arrived back early from semester break joined me for Mass in our small chapel at the BU Catholic Center. Usually our Sunday Mass is at the interdenominational chapel, but because we were few in number, we squeezed in together at our small chapel. As I looked around during Mass, I was touched to see how these young people help one another to encounter Christ. They are living a friendship together, praying together, helping one another to live a Christian life, and growing together in Christ. Specificity matters in Christianity. God has brought these particular young people together at this particular moment in time. It is here and now that they are encountering Christ. Sometimes, there is an attempt to get Catholic people to "transcend" the specificity of their life. In other words, we hear it said that "It doesn't matter where you go to Mass." On some level, this is true. One of the great things about being Catholic is that you can go to Mass at any church in the world and know that it is the same Mass. And, of course, that's a beautiful thing. What matters ultimately is the Eucharist. But, I think we should be very cautious about being too dismissive of specificity. God is specific. He called Abraham--specifically. He called Moses--specifically. He led them to a specific promised land. He became flesh in a specific womb. He died on a specific Cross. He used Eli to reach Samuel. He used John the Baptist to reach Andrew and John, and Andrew to reach Peter. He encountered them at a specific moment in time--"It was around four o'clock in the afternoon." Specificity matters in Christianity. Flesh matters in Christianity. Time matters. Matter matters. Without specificity, Christianity becomes vague and theoretical. If we don't take specificity seriously, I think we will fail to take evangelization seriously. Without a true seriousness about specificity, evangelization becomes a notion. But, when we take the concrete seriously, then evangelization becomes about "the person in front of me," and not some vague idea of "spreading the good news." Charity is specific. I love this person and this community. While it is true that every Catholic is part of the universal Church, he became part of the universal Church because he heard the word preached by a specific person. He was baptized by a specific priest and within a specific community of the universal Church. Today, I offered Mass with a very specific community. Like the Twelve whom Jesus specifically chose, he chose these young people to be together in this particular moment and place in their life. They have to know that Jesus is doing something special among them. Not in some vague, general way. No, Jesus is doing something in and through this specific community. The more they are attached to one another in true Christian charity, the more they will be compelled to share their joy with others. We experience the love of God in and through specific encounters. I experience Christ's presence and love through this specific community. I want them to invite others to be part of our life together. I want them to ask specific other young people to be part of the Church. I want them to be points of encounter for other young people on our campus. What I want for them is that some day, many decades from now, some Catholic will be looking back upon his life and his conversion, and he will call to mind the name of one of these fellow students, and he will say, "I became Catholic because I met her and she invited me to come with her to the Catholic Center. It was around four o'clock in the afternoon." Some scattered and random thoughts at the beginning of a new semester. It occurred to me today that I was ordained 18 years ago this year. A few seconds after I had that thought, I realized that some of you were born in that same year. We shall never speak of this again. I hope that you had a restful Christmas Break. Maybe you discovered that the change in schedule and routine made it challenging to live your spiritual and moral life well. This is not an unusual experience. If things went a bit off the rails during the past month, make going to confession a priority this week. You know where to find me. I am very happy to be of service in this regard. The Catholic Center Retreat in Maine is the weekend of February 20-22. The retreat is entitled, "Proclaim." Not only do I want you to come on this retreat, but I want you to invite--at least--one other person. There's nothing greater we can do for another person than to provide them an opportunity to encounter Christ. Do something great over the next few weeks: invite others to encounter Christ! Is Jesus calling you to be a priest or a religious? Just get it over with and say, "Yes." Don't torture yourself trying to find loopholes. There are thousands of young people on our campus. Some of them feel alone and isolated. How about reaching out to them? Thank you to all of you who work so hard to make our Catholic Community strong. We are really blessed to have some great people in our community. The Catholic Center at Boston University always needs more money. Yeah, that's just a fact. We have an important mission, but we need donors to support that mission. Do you know of anyone who wants to help us in our mission of "Making Catholics and Keeping Catholics?" One of the great things about the Church is that we all help one another and learn from one another. I learn from you and from your example. One of the things that I love about being a priest is that, after almost eighteen years, I still feel like I'm just beginning to learn how to be a priest. If you ever find yourself not feeling like being holy or feeling like it really doesn't matter, just remember that your example helps others. It helps me. The Catholic Center at Boston University always needs more money . . . oh, I already said that. We should all pray more together. Let's work on that. Let's find ways to be more intentional about praying together. Jesus has gathered us together in order to do something great and beautiful in and through us. Let's cooperate with His grace. Let's live our life together like we are on a mission because . . . we are on a mission. A shepherd without sheep is kind of pointless. While I'm grateful for the little break over Christmas, I'm glad that the sheep are back. A couple of years ago, I received a young man into the Catholic Church and I confirmed him. His name is Michael. Although recently engaged to be married, Michael nonetheless left his full-time employment at the beginning of last summer and became a FOCUS Missionary working at MIT. Shortly before Christmas this year, I was at a party hosted by the FOCUS Missionaries at Harvard, MIT, and Boston University and I met a student there. While we were talking, Michael approached and I asked the student, "Do you know Michael?" "Yes," he replied. "Michael is the reason I'm becoming Catholic." There's a tendency in a lot of us to equate the "Catholic Church" with big events, big programs, and big personalities. As I mentioned in an earlier post, I attended a conference this month where ten thousand university students came together to draw closer to Christ and to the Church. It was a big event. But, what most struck me about the event were the encounters with individuals who--all over the United States--are just living out their Catholic life in quiet, unassuming ways. There are a lot of good people doing a lot of good work. This Christmas, I received a card from an elderly woman named Barbara whom I received into the Catholic Church and confirmed in her parlor a few years ago. She is in her late eighties or early nineties. A woman named Hannah (who has since died) was a member of my parish and used to visit Barbara on a regular basis. Through their friendship, Barbara asked to become Catholic. Hannah arranged for me to come and visit Barbara at home and instruct her in the Catholic Faith. Barbara became Catholic because of Hannah. The Christmas season which we just concluded reminds us that Christianity began in the womb of one woman. God's entire plan of salvation hinged upon a young girl from Nazareth. It wasn't in Jerusalem, Rome, or Constantinople. It was Nazareth. It wasn't a major political, religious, or cultural personality. It was a young girl. I am Catholic because that young Nazarene girl said, "Yes." I am a Catholic because a fisherman and his brother left their nets, boat, and father behind and followed Christ. Throughout the Church, there are witnesses. Some of them are elderly and have hardly any income. 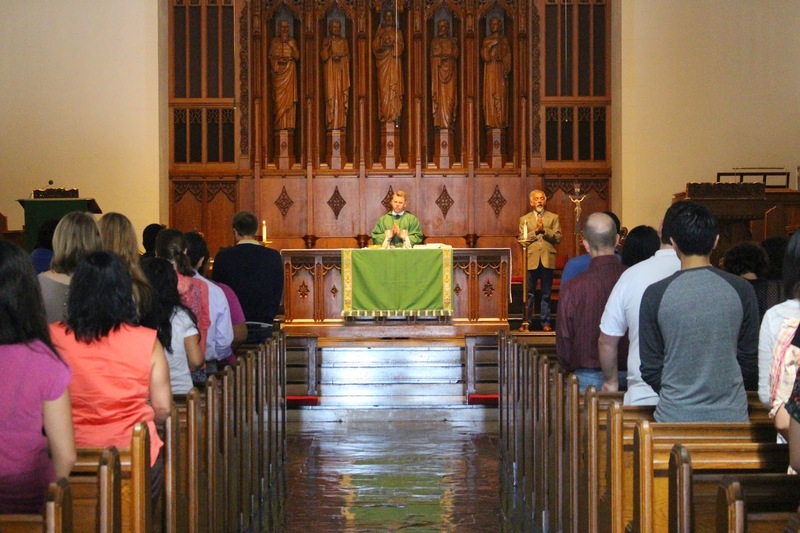 They show up at daily Mass and croak out the "alleluia" before the Gospel. They pray for their children, their grandchildren, and their great-grandchildren. Some of them are young men and women in the workforce. They pop into local shrines for adoration or confession on a regular basis. Some are married men and women who take seriously the obligation to raise their children in the Catholic Faith. Some are wealthy and are always looking for ways to generously support the good works of the Church. Some are college students who are seeking to live lives of holiness and who--despite all of the odds being against them--read the Scriptures, pray, and seek to understand what the Lord is saying to them. Some are priests, deacons, and religious who continuously take on more work with less resources because they don't want to miss any chance to share the Gospel. Sometimes we think that it is the stuff that makes the headlines in the newspapers that really matters. We think that good press or bad press is what ultimately determines the fate of the Church. There were, however, no media reports of what happened in Nazareth two thousand years ago. And, had there been, would they have been favorable or negative? This is not to dismiss the media, but it is to say that the secular media is not the primary instrument of the Gospel. The young college student that I met at a party clearly stated the reason he was becoming Catholic: He met a young missionary named Michael. Barbara became Catholic because a woman named Hannah communicated the Gospel to her through their friendship. 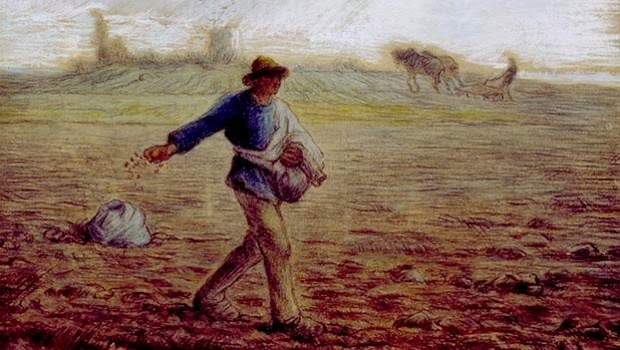 The Church grows because of faithful Catholics who labor in the vineyard. They aren't the stuff of headlines. They are the people who visit the sick and the imprisoned, donate to support the Church, pop into confession on a regular basis, teach religious education, sing in the choir, and invite others to meet Christ. I am grateful to be surrounded by people like this. I need people like this. They are the people whose example sustains me in my Catholic life. They are priests and lay people, nuns and deacons, young and old who are waking up every day and following Christ. They usually don't make the headlines, but they are making disciples.